In the season of merry, cheery, fa-la-la, it can be invigorating to catch up with serious-minded contemporary art. Several of the fall’s more interesting offerings are still on view, ready to provide some counterbalance to consumerism and overindulgence. The largest and possibly the grimmest is Aftermath. It’s an exhibition at the McMichael Canadian Art Collection in Kleinburg, Ont., devoted to Stephen Andrews’s profound encounter with images of the Iraq War in a project dating to 2003. If Vietnam was the first war witnessed on television, this one was the first witnessed by the internet. Andrews’s material is drawn from soldiers’ blogs and other unofficial sources depicting the everyday horrors as American troops entered Iraq. There are images of the burning oil fields and the humiliated Iraqi prisoners at the notorious Abu Ghraib prison, but Andrews’s approach is not documentary. To create these works, he reproduced found photographs and video stills on parchment or mylar by making crayon rubbings through a piece of metal mesh. Because he limited himself to the four colours of the commercial printing process – cyan, yellow, magenta and black – and because the mesh produced a grid pattern, the pictures look pixilated, like grainy television images or cheap dot-matrix printing. And yet they are hand-made, as Andrews forcefully slowed down the process of snapping, blogging and posting to the speed of art. 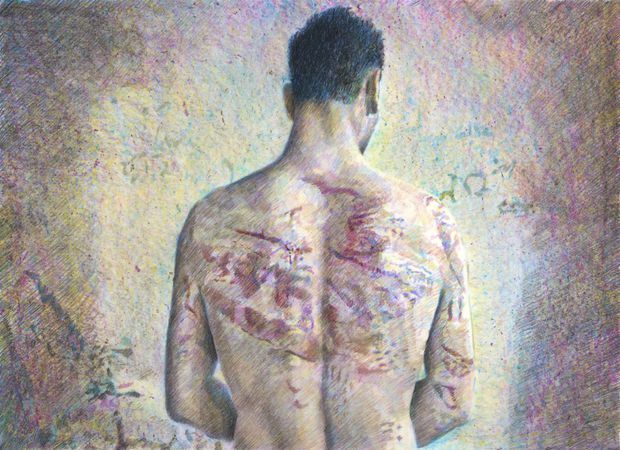 Syrian man's back (2013), watercolour pencil on frosted mylar, by Stephen Andrew. Sometimes, these soft, pointillist drawings can become almost beautiful. The show opens with a small image, Friendly Fire, in which a scene is marked with several red splotches: The photographer was hit and his blood splashed on the camera lens. From there, Andrews produced a second work that is simply one blood spot enlarged to the size of a mighty abstract sun. It’s called Yesterday’s News Remembered Today and the title seems to perfectly summarize the way this reflection on the legacy of Iraq surmounts the passing years. Catherine Heard is another artist with a complicated, multilayer technical process, although her uncanny art looks inward rather than out. At Birch Contemporary in Toronto, she is showing a “self-portrait” based on a medical scan of her own head, an orange-red sphere severed from the body that appears to be floating in space – if one looks inside the wooden viewer where it’s projected. 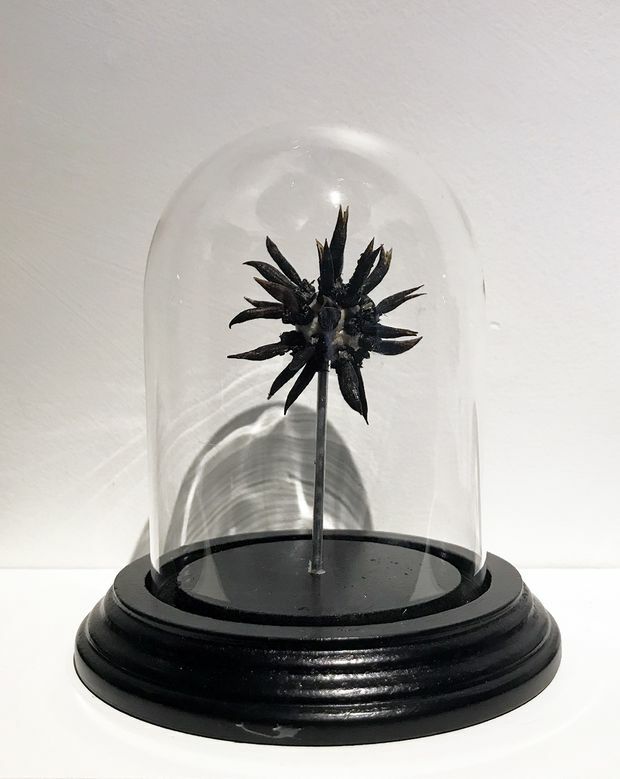 Plant material, Japanese paper, oak gall and iron ink (2018) by Catherine Heard. The piece is part of an intriguing project that places scans produced by contemporary imaging technology inside Victorian viewing boxes to create some kind of steampunk anatomy lesson. First, Heard builds fictional microbes or clusters about the size of a gumball using bits of plant matter; these preliminary objects are also included in the show. Then she has them scanned (on a machine usually reserved for lab animals) and runs these images through software that gently animates them. When seen through rounded glass viewers set in antiqued boxes they swirl delicately in space. What are these strange orbs, microscopic organisms or unknown planets? Heard creates a fictional biology that pulls a viewer into her puzzle. The Toronto show is also a chance for gallerist Robert Birch to exhibit in Toronto Heard’s Myrllen: A Portrait, which made its debut at the Art Gallery of Hamilton in 2016. The piece is inspired by the story of a schizophrenic woman in a Tennessee hospital in the 1950s who obsessively embroidered a coat. Heard, who first saw the strange coat in 2001 in an American museum, has analyzed its mysterious iconography in some detail (and published her findings). Her own work evokes the mental landscape of a ghostly Myrllen in the most startling manner. She sculpted a female head out of layers of found embroidery held together with wax and then asked a Hamilton hospital to scan it. (Radiologists waited for an occasion when a patient was a no-show.) The results are projected onto a darkened screen, revealing a headful of embroidery, as one ghost-like skull of flowers and figures gives way to another in an eerie tribute to the shadowy Myrllen. A visit to the Olga Korper Gallery in Toronto’s west end will feel playful in comparison – the gallery’s floor is covered with a riot of steel ABCs – but Rust Garden has some pretty serious purpose. This work by Matt Donovan and Hallie Siegel was created with a Canada Council grant tied to Canada 150; the Toronto artists commissioned a metal works to laser-cut copies of every letter and punctuation mark in Hugh MacLennan’s 1945 novel, Two Solitudes – all 707,349 of them. You can sit on benches provided and admire them, you can crunch over them – it’s like walking on a pebbly beach – or you can go hunting for a particular letter. This sounds amusing, but Two Solitudes is that classic Canadian novel about the linguistic gap between French and English and there is Babel lying on the gallery floor, narrative dismantled and meaning lost in the jumble. It’s a point nicely reinforced by a companion piece, Impressions, a large-scale text both imprinted into and embossed onto the white gallery walls: The text is drawn from a Socratic dialogue about the invention of writing, one side arguing letters will preserve thought, the other fearing they will make us lazy and destroy our ability to recall. In an era when technology is changing reading, text and memory, Rust Garden smartly deconstructs our relationship with the written word.